ZOYE is one of leading manufacturer and suppliers of high quality eyeglass parts and sunglasses parts in china. TAILI glasses parts co.,ltd(new name:ZOYE), is one company supplying a variety of eyeglass parts and sunglasses parts since 1986. Our main products include eyeglass hinges,spring hinges,eyeglass nose pads,pad arms, eyeglass temples,bridges,screws and lens etc. 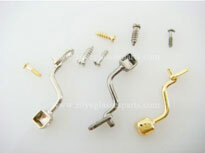 The eyeglasses hinges,which are usually made of nickel or copper material, can be devided into three types: hinges for metal frame,for acetate frame and for wood eyeglass.While rivet hinges are universal hinges which are almost suitable for all material of glasses. Small retail order is acceptable besides wholesale here. We supply silicone eyeglass nose pads and vinyl nose pads mainly,such as air active nose pads,silicone saddle bridges,stick on nose pads and eyewear straps etc. Eyeglass temples could be made of high nickel,stainelss steel,acetate,rubber and silicone material etc. As long as you order metal temples, the acetate temple tips,or acetate terminals also called could be matched well. If you prefer cheaper price,the plastic injection tips are recommended then. Colors,hole size,length and shapes are as per your requirement. 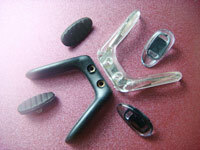 Different pad arms are used on different frames. 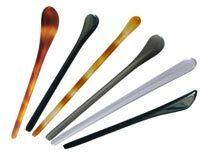 According to usage, they could be divided into pad arms for metal frame,for plastic frame and for wood frames. Among them,some of models are versatile between plastic and wood eyeglasses. We have stocked billions of micro eyeglass screws though most of them are not shown on our page. whether you want to find screws for pad arms, screws for hinges,or self-aligning screws for spring hinges and rimless eyewear,all of them could be found here! Different shank lengths,turning or self-tapping screws are also available. Other micro eyeglass accessories,such as rivets,washers,spacers,bolts,bushing and rimlocks,those small stuff are able to buy here,we are one super market of various eyeglass parts online.